I’m glad the FCC ditched the Orwellian inspired “net neutrality” regulations last Thursday. Under the government controlled so-called “net neutrality,” the internet would be treated like your utility. Think how much you like your cable company. Beta or VHS? Beta was better. The marketplace selected VHS. If you applied the Net Neutrality formula to this famous of all tech throw downs, all Blockbuster stores would have had to carry both tapes by GOVERNMENT edict, because … EQUALITY, of course. By the way, whatever happened to Blockbuster? If you allow government to regulate the “channels” of the internet, those channels become the play-things of the politicians. No thanks, that happens enough. You know, like before 2015. For decades, government selected your livery service. Along came Uber and Lyft, and the government was confronted with a choice: do we continue to dictate how people get a ride and look like the buggy whip salesmen or tick off our big donors at the taxi companies? Quick whip-around: Who do you ‘call’ first, the taxi company or the app on your smart phone? Politicians said net neutrality would create a more egalitarian society. The pro-net neutrality people believe government can divvy up the internet to become more equal to users. Americans believe in equality. But innovation is the new egalitarianism. Quickly, tech gets cheaper, faster, better. For everyone. Just ask Gordon Moore. Or Siri. If you’re among those who believe that the libertine, peach-fuzzed, hoodie wearing tech nerds need societal guard rails to keep them in their lane, I wholly agree. But for those who believe we need a new phalanx of government regulators to do it like they oversee your electricity rates, I give you Napster. 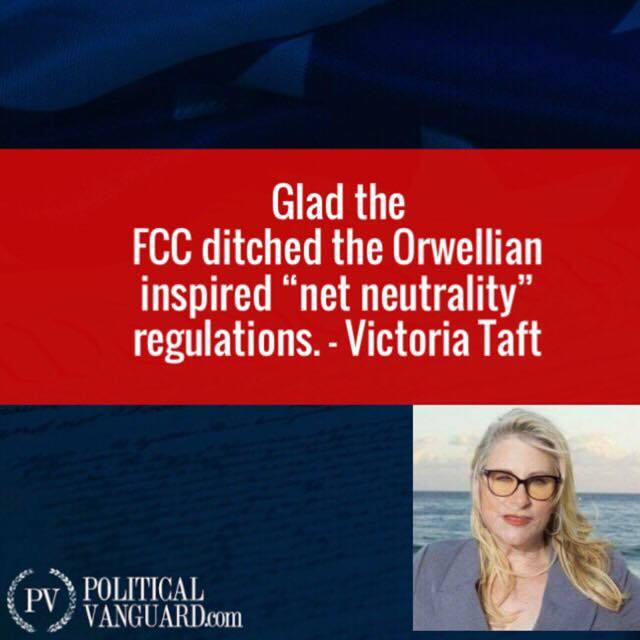 But with the sterile sounding and shape-shifting definition of “neutrality,” the Obama Administration layered in a bunch of regulations that introduced an entirely new way of treating the internet. The new laws treated your internet as a utility they could control. Those demonstrators and protesters and doxxers out there last Thursday didn’t put that on their manufactured signs. Because, well, they don’t want you to know that. Now there’s an inconvenient truth. Everyone’s “cutting the cord” now. But with the Obama regulatory scheme, there would be less choice. What good is cutting a cord if there are fewer choices of where to ‘plug’ in? If you’re an internet innovator working in a closed market, you’re going to ‘innovate’ where the government tells you to. Like PacMan, everywhere that guy turns would another government-created regulatory barrier until only one slow path revealed itself. That’s what Obama wanted the internet to become when this law was passed 2 years ago. What’s so scary about things the way they were just TWO YEARS AGO? I liked it when companies battled it out for my business. With the Orwellian “neutrality,” government would have picked winners and losers. No thanks. The Wall Street Journal reported this week that 72% of the comments to the FCC on net neutrality were faked. Government regulators didn’t even know that until the WSJ pointed it out. These are the people net neutrality fans want to govern the internet? If the government regulations introduced by Obama 2015 had been introduced at the dawn of the internet, we’d behold the ‘equality’ of mediocrity, borne of dream-killing regulation. And we’d do it while reading a newspaper, in the back of a taxi, on the way to a Blockbuster. The only thing I want right now from government is more bandwidth … and for them to stay out of the way. I know these ethics-free tech guys are pirates, but if given the choice between more government and less freedom, I’ll take my chances with more freedom. I have to express my appreciation to this writer for rescuing me from this setting. After surfing throughout the internet and meeting notions which were not pleasant, I believed my entire life was done. Existing without the strategies to the problems you’ve resolved as a result of your report is a serious case, as well as those which may have badly damaged my career if I had not come across your website. Your talents and kindness in playing with almost everything was useful. I am not sure what I would have done if I had not encountered such a solution like this. I can at this moment look forward to my future. Thanks so much for the reliable and results-oriented guide. I will not think twice to suggest your blog to anyone who needs and wants guidelines on this situation.